Invisible dual infrared beam triggers a pleasant chime sound and registers a count on the digital counter when the infrared beam is interrupted. Different chimes let you know entrance or exit of customers. Counter can be reset manually. 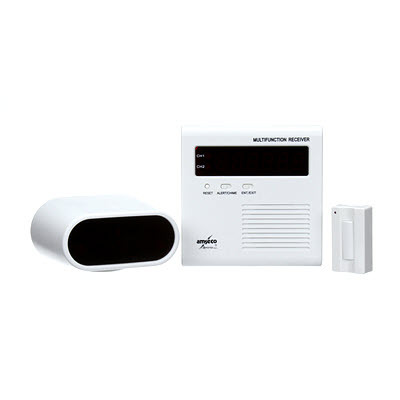 Equipped with an alert mode which sounds the built-in siren when add to security system. Metal Doors reduced range. Includes wireless push button to use as door bell. Power failure memory back-up. Uses 2 AC adapters.